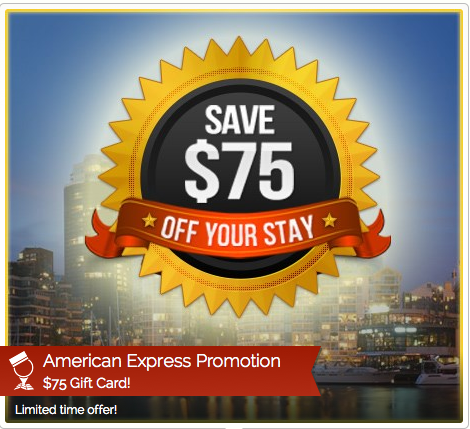 Receive a a $75 Prepaid American Express card when you make a Vancouver hotel booking via beVancouver: Full details here. Through a partnership with American Express, beVancouver is pleased to offer a $75pre paid gift card for any booking made through December 31st 2013, for a stay by February 28th 2014. This promotion is offered at all our properties and gift cards can be used to cover all hotel costs, such as room rates, on-site restaurants, and room service, or at surrounding restaurants and shops. This booking is cancellable and you will receive your $75 American Express pre paid gift card at check in from the hotel. All standard terms and conditions apply.